Canada’s hotel industry is one of the hottest sectors in real estate today, accounting for $1.46 billion worth of transactions last year as institutional players and other non-traditional buyers have poured into the space. 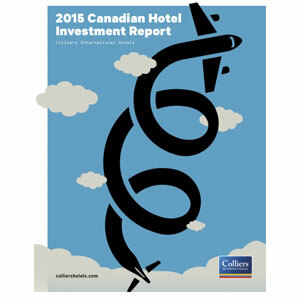 A string of eight $1-billion-plus years over the past decade (broken only by the post-crisis years of 2009 and 2010) is expected to continue as fundamentals for the lodging industry improve, according to analysis from Colliers Canada’s 2015 Canadian Hotels Investment Report. “We’re definitely now a market that is a $1-billion plus in hotel investment activity in what historically used to be $500 million on average and we see that continuing,” said Alam Pirani, Colliers Canada‘s executive managing director and head of the Canadian hotel group. What’s changed for the hotel sector in the past few years has been the entry of institutional heavyweights Morguard and Kingsett Capital. In 2012, Morguard Corporation purchased the Toronto Airport Marriott for $30.6 million, marking their entrance into the lodging sector, and a year later Morguard bought the five-property Toronto Marriott Select-Service Portfolio for $70.6 million from Lubert-Adler Real Estate Funds and Concord Hospitality Enterprise. Kingsett joined the party last year, announcing a strategic investment in InnVest REIT (INN.UN-T) along with Orange Capital. Kingsett kicked off 2015, along with InnVest REIT, with the $186.5-million acquisition of the Fairmont Royal York in Toronto, with the seller, Ivanhoe Cambridge staying in as a 20 per cent partner. Colliers expects 2015 to stay “robust” for real estate values despite a modest slowdown anticipated for Calgary (+3.4%) and Edmonton (+2.0%). The strongest markets nationally are expected to be downtown Toronto (+14.2%), downtown Vancouver (+10.1%), downtown Montreal (+8.8%) and the Alberta Mountain Region (+8.2%). “No one anticipated what would happen to the price of oil but notwithstanding that, it is a very healthy environment, operating fundamentals are very strong, supply is in check – that has always been a big challenge for our industry,” said Pirani. “The conservative lending environment certainly helps. Given the slide in the Canadian dollar – from parity between 2010 and 2013 to approximately $0.80 by the end of the first quarter of 2015 – making Canadian hotel properties increasingly attractive to foreign buyers. Conversely, the loonie’s dive should keep more Canadian investors close to home and interested in deploying capital in our markets. Colliers is also counting on China. Colliers is also looking to a continuation in the recent trend of hotel properties converting to alternate use may in major markets. There were 127 trades reported for the year, roughly split equally between Western and Eastern Canada. This compares to a low of 74 trades at the bottom of the cycle in 2009. Last year saw the greatest amount of large single asset transactions since the last peak in 2007, with 14 deals trading above the $25 million threshold. Colliers found activity was supported by an elevated level of competition by a variety of buyer groups for high-quality and well-located assets across the country. Private investors were the most active in 2014 accounting for 30 per cent of buy-side transaction activity ($434 million) compared with 25% of volume ($317 million) in 2013. Activity by private capital has been a consistent segment of deal volume, averaging $310 million per year since 2009. The largest private-sector deal in 2014 was the Best Western Plus Sands in downtown Vancouver for $30.3 million (or $252,900 per room), followed by the Courtyard by Marriott Toronto Brampton for $25.1 million (or $157,900 per room). Private investors comprised the majority of transactions with 74 trades over the course of the year. Real estate companies accounted for 21% of overall volume – driven primarily by land motivations for eventual redevelopment, conversion to alternate use or diversification of their real estate portfolio. There were 14 acquisitions by this group, the largest being the Courtyard & Residence Inn by Marriott Calgary Airport for $66 million ($201,200 per room) and The Fairmont Empress Hotel in Victoria for $48 million (or $100,600 per room), both of which were acquired by diversified real estate companies. Buying activity from public companies totaled nine separate deals, primarily driven by Winnipeg’s Temple Hotels Inc. (seven hotels including the Hotel Saskatchewan Regina) and InnVest REIT (Hyatt Regency Vancouver). Holloway Lodging Corp. acquired one hotel during the year. Institutional groups were active in major urban centres such as Toronto, Calgary and Halifax acquiring five substantial assets which accounted for 14% of total volume for the year. Hotel investment companies continue to be motivated by “opportunistic turn-around” deals. These companies have historically been strategic in hotel investments commonly timing the market and acquiring properties at a lower price per room and repositioning with capital and other value-add opportunities. They were particularly active in Ontario, most notably acquiring assets from institutional sellers. There were 25 transactions to HICs, the largest being the Delta Toronto East for $32.75 million ($89,500 per room).